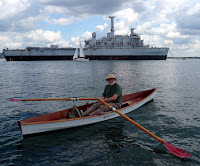 Portsmouth Harbour, home of the British navy, is a rather intimidating place for a sculler in a very small skiff. Big, sometimes choppy, lots of fast motor boats and occasionally huge ferries and the odd aircraft carrier. But today was sunny and still, so I went out to see if I could catch up with the Dinghy Cruising Association and try out one or two gadgets. Well, actually four gadgets, sad sack that I am - mobile phone, satnav, camcorder and digicam. And I used them all. The video was taken with the new (to Britain) Flip Ultra, the simplest camcorder you can buy. Shooting clips is a matter of pressing the red button to go, and pressing it again to stop. Back at base, you can chop out the boring bits and assemble the rest into a smooth mini-movie so easily even I can do it. 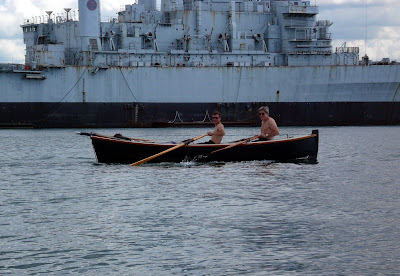 Later, I happened on a pair rowing like mad for the harbour mouth in a traditional-looking pulling boat in grp, with a cat rig stowed inside. We took pictures of each other with my Panasonic Lumix digital camera (that's the former HMS Intrepid in the background). 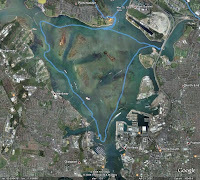 Back home, I uploaded the satnav track in .gpx format from my Satmap and discovered that Google Earth now supports .gpx, hooray! But it still won't let you edit the track by removing boring and irrelevant stuff such as tracking my car on the road to the slipway, boo! 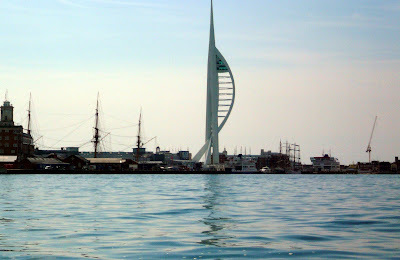 Here is an image of my trip round the harbour. If anybody knows how to remove the non-boating tracks, do let me know, please? Missed you again - we were out from Warb Rd to East Hd on Sat in the Mirror. Had the girls & thought beach would be a more poular destination than anywhere in Pompey hbr! Nice day & a good sail too - Sapphi was quite getting into it on the way down, although it feels odd being a passenger in your own boat! Re GPS tracks, I'd recommend GPSUtility fo such things, you can edit downloaded files to your hearts content before putting them on GE. Also good for editing WP lists, much easier than on the GPS as a rule. Free version available to download with a few capacity restrictions (Google for GPSU), although even I've paid the money, & well worth it I reckon!